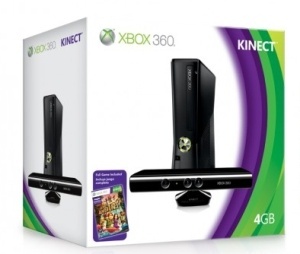 Microsoft has sold ten million Kinect motion controllers for the Xbox 360, making it the fastest-selling consumer electronics device in history. Microsoft apparently wasn't kidding when it predicted that Kinect would be the biggest hardware launch ever. Ten million units sold, accompanied by ten million unit sales of standalone Kinect games, is impressive no matter how you look at it and good enough to land it in the Guinness Book of Records, which declared it the fastest-selling electronic gizmo of all time. Sales have naturally tapered off since the holidays but in its first 60 days on the market, beginning in North America on November 4, Kinect sales reached eight million units, an average of 133,333 every day. "The sales figures here speak for themselves," said Guinness World Records Gaming Editor Gaz Deaves. "According to independent research, no other consumer electronics device sold faster within a 60-day time span, which is an incredible achievement considering the strength of the sector." Microsoft claimed that more "transformative" experiences are on the way this year, with a must-have lineup that includes Avatar Kinect, Body and Brain Connection, Michael Jackson: The Experience, Child of Eden, The Gunstringer, Kung Fu Panda 2, Carnival Games: Monkey See, Monkey Do and Sesame Street: Once Upon a Monster.